Jumble of transplants -- basil,tomatoes,eggplants and peppers -- waiting for the right time to get planted. To plant or not to plant? That is the question. Whether it is wiser to plant now and risk the slings and arrows of outrageous weather or to wait, potentially squandering the too-short lease of summer. Such quandaries face Z4 gardeners in this,the merry,merry month of May. Last year’s warm,dry May duped many into planting their tomatoes early only to have them decimated by a rogue frost on May 31st. This year, looking out to Memorial Day weekend —the traditional safe date for planting tender vegetable crops like tomatoes,beans,squash an their ilk —the long-range forecast is for relentless sun and record-breaking heat. While frost may no longer be a consideration,other factors need to be weighed in deciding when to plant tender crops. Soil and air temperature are of course critical. Here’s a great chart that shows the practical and optimal temperatures for planting common vegetables. I’ve never used a soil thermometer but find the old fashioned guide —don’t plant beans or corn until you can sit on the ground with a bare bum —to be very useful. No,I don’t take it literally,but use my hand to test to test the soil temperature and apply the imagination to decide how a tenderer part of my anatomy would feel, and by extension whether the cold-sensitive plants would be happy. This week the soil felt cool but not cold so I went ahead and planted bean,squash and cucumbers seeds directly in the ground. Germination is likely to take about a week so even if we were have a freak frost in that period,the still-to-emerge plants will be safe underground. Moon phases can also influence the decision of when to plant – especially as promoted by those following the biodynamic gardening system. The specifics can get excruciatingly complicated and seems to add way too many factors into the “when to plant”decisions. But in general,I understand that planting seeds during the waxing moon can benefit and speed germination while transplanting during the waning moon can better help the roots get established. The influences are so subtle, I can’t say if it makes any difference in real life,but just imagining how plants and the moisture in soil might ebb and flow like the tides, makes me feel richer and more connected,so if all other factors support it,I try to plant seeds before the full moon and transplant after. The full moon falls on May 28th this year. Given that cold isn’t likely to be in the picture,the most significant factor for me in deciding when to plant this year is rain,or the lack of it. There’s no significant precipitation forecast for then next 10 days. That’s a big deal. Watering is time and/or resource intensive so I’m holding back on transplanting tomatoes,peppers and eggplants. 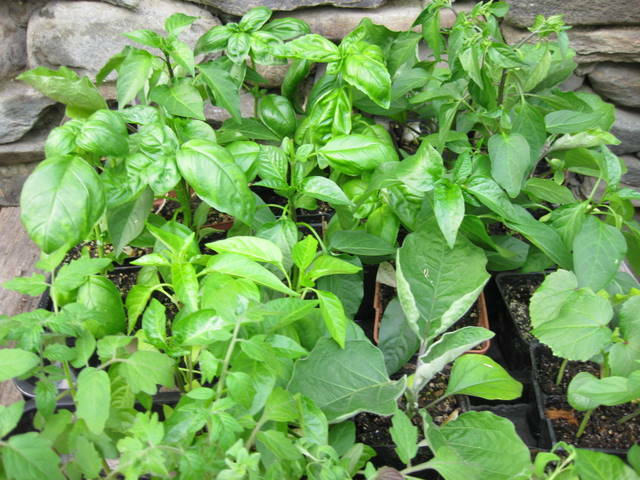 It’s much easier and takes much less water to hydrate plants in pots than to water them in the garden. Also,guests,out-of-town trips and other activities that are likely on a long weekend often detract from gardening, so that should be a consideration as well. Transplants may suffer if they go in before Memorial Day then are neglected,as they need regular, deep watering until well-established. Seeds need regular watering too but once germinated,they seem better able to find the water they need to thrive. Having weighed all these factors, I’ve decided to direct-seed all my beans,squash,melon,cucumber,and any miscellaneous herbs and flowers like dill and calendula this weekend. But will hold off on transplanting tomatoes,peppers, eggplants and basil until the week of Memorial Day. To minimize the amount of watering necessary this week,I’ll hold back on planting corn seeds too.